Mountain Shadows # F02 -Magnifique Pet Condo bienvenus! Spa / Sauna / Pool / blanchisserie. Amenez la famille à Mammoth Lakes pour une escapade en montagne. Mountain Shadows # F02 est agencé en studio avec 1 salle de bain et peut accueillir jusqu'à 4 personnes et les animaux domestiques. Ce condominium est très bien situé avec les activités environnantes. En 5 minutes de route, vous rejoindrez l'Eagle Lodge, le télésiège Eagle Express et le parcours de golf Snowcreek. Les magasins et les bons restaurants sont même accessibles à pied. Ce condo à la montagne sur le thème vous accueille à l'intérieur. La cuisine est à votre gauche. La cuisine est entièrement équipée avec des appareils (à l'exception d'un lave-vaisselle) pour aider un chef à préparer des repas savoureux. Une table intégrée peut accueillir 4 personnes. Parfait pour les enfants, et un ensemble de lits superposés en alcôve se trouve en face de la cuisine. Le lit superposé a 2 lits jumeaux. Le salon dispose de sièges confortables entourés de la télévision. Un magnétoscope et un lecteur CD sont également équipés pour votre plus grand plaisir. Un séparateur de section peut être dessiné pour créer une chambre principale. Cette chambre est meublée avec un lit Queen confortable. Il y a une cheminée à quelques pas. Allumer un feu et créer une ambiance chaleureuse. La salle de bain est attachée dans cette section du studio. C'est une salle de bain complète avec un combo douche / baignoire. Jetez un coup d'œil à toutes les commodités de Mountain Shadows pendant vos vacances. Il y a un parking extérieur, 3 salles de lavage, 3 spas et saunas et une piscine avec barbecue ouverte en été. La navette gratuite Green Line s'arrête près du complexe en hiver et se rend à Eagle Lodge et au Village. 1) Ne laissez pas votre chien seul dans l'unité. 2) Ramassez après votre chien. 3) Gardez votre chien en laisse (c'est la loi). Il y a 100 $. 00 amende si les règles ne sont pas suivies. Remarque: Si vous apportez un animal de compagnie, les frais d’animal de compagnie ne sont pas inclus dans ce prix total. Des frais supplémentaires pour animaux de compagnie seront appliqués après la réservation. Si vous avez des questions ou des préoccupations, n'hésitez pas à nous contacter. We rented the place for 4 nights, upon on arrival @ 6 p.m. we realized the carpet was wet and it was soaking wet by the bathroom. We immediately called the office and after 20 minutes they sent someone over who examined the floor but kept looking at the ceiling. He couldn't communicate effectively, he made a phone call and left saying that someone else has to come and take a look. We called the office again and asked to either move us to a different unit or have someone fix it After another 20 minutes Carols showed up. He examined the floor with his hands and he also kept looking at the ceiling. He then accused me of lying about the wet floor and said that it's only cold! I asked him to take his shoes off and walk for a second to see how wet the floor was but he refused and said that I can leave without getting paid and complain to VRBO but he will not do anything about the floor. He was rude, disrespectful and accusatory! I told him he's there to fix the issue but he was being very disrespectful and not willing to test the floor. We had to leave the place and stay at a hotel near by with my small child in the middle of the night! DO NOT RENT THIS PLACE as it is NOTHING LIKE the picture . The place is filthy and disgusting, the carpet is flooded and must be molded since the management doesn't do anything about it. The management is in it for their own profit and don't care about customer. This places is a SCAM. Pay a little more and stay somewhere that is safe, clean and they value their customer. We sincerely apologize for the service you've received. This was unacceptable on our end & we genuinely are sorry. Our team has been notified of this issue & the carpet has been inspected again. Again, we are so sorry & strive to provide a better experience for our guests. Thank you! Thank you for staying with us in Mammoth. I have passed these notes along & we hope to really improve the quality of this unit for future guests. We apologize for the inconvenience & hope to host you again. Thank you. The owners should probably know the management company Grand Mammoth Resorts is giving out the wrong jacuzzi code on purpose. I saw this in another review and it's true. We stood out in the cold in bathing suits and towels and could not get into any of the jacuzzi tubs. That was part of the appeal of paying this much for a studio condo on MLK weekend. I let the management company know when I returned the keys and they acted like the owner changed it and didn't tell them. I will never rent a property from Grand Mammoth Resorts again. The unit was as pictured but agree with the other reviews, no wifi and 5pm check-in is not standard and your money is better spent elsewhere. Property was OK, management company was horrible. Recieved my confirmation e-mail from management company for our stay but, never received information on how to get into the unit. Called the morning of our arrival & they sent the info. Arrived at night & had trouble accesing the keys, called the management personnel on call, after 1 1/2 hours of waiting, finally got it worked out. Tried to access the hot tub & pool advertised in the listing, code provided by management company didn't work. Called the phone # in the office & was told, that is not the code, we actually were not supposed to be using the hot tub & pool, as they have spoken withe the management company many many times & still they advertise it is available. Other than that, unit was OK, still with Christmas decorations up in June. Definately will not use any property associated with this management company in the future. 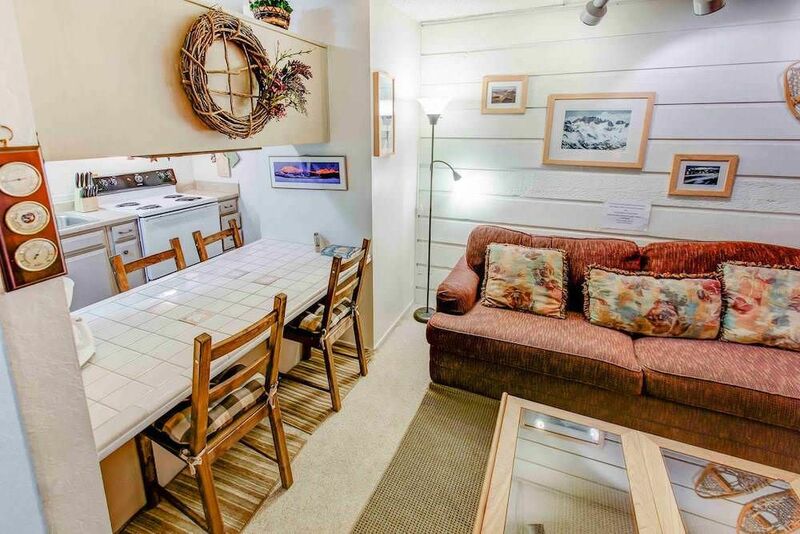 Very cozy, nice and love that not only is it a rental but you can tell the owners love Mammoth. Great to have a lot of cooking utensils. Clean room and comfortable bed. Only down side, no wifi. We are sorry for the inconvenience but are happy to hear you had a good stay. We hope to host you again and thank you for your feedback. Nice getaway and dog friendly. Perfect little condo, great location. clean and comfy. Would definitely stay here again.